Back in April I took my first solo story-gathering trip in my new role with the Wycliffe News Network. I’ve had a hectic schedule of three more trips on three different continents since then so I haven’t yet told you about this expedition that started the year. Well lean back in your chair, I’m taking you on a journey to the Kingdom of Tonga. I’d caught word in March that there was a brand new Bible translation organisation sprouting up in Tonga and I jumped at the opportunity to visit with some leadership consultants from the Wycliffe Global Alliance. I’d been working on story leads since December and I didn’t have much information but decided to visit on a gut feeling that it would be worth meeting the people behind this face to face. Emails move slowly in the Pacific, and when the King of Tonga died tragically on 19th March, it took a little while to confirm whether we were still welcome to visit the Kingdom. So, like all things in the Pacific, this trip was planned at the last minute. Travelling into uncertainty like this caused me a bit of stress, since I had no accommodation or transport organised and I wasn’t 100% sure that anyone would be available to meet me at the airport. I don’t expect people to drop everything to come and get me, but I didn’t know where to get a taxi to! I’ve been in that situation before in PNG and it occupied my mind during my journey to Tonga. On the way I spent a few hours of a beautiful autumn day in New Zealand where God encouraged me to trust Him. I arrived in Tonga and was happily met by not one, but two, beautiful faces! Meet Maxy and Juliet. They both dropped everything to come and collect me from the airport and look after me before sending me off to the smaller island of ‘Eua that afternoon. Like many Tongans I met during my visit, they are wearing all black outfits as part of the official mourning period for the death of the King. They took me to the nearby YWAM base where a small room was prepared for me to rest, recharge my batteries (literally), and take photos of the gorgeous kids living there on the base. 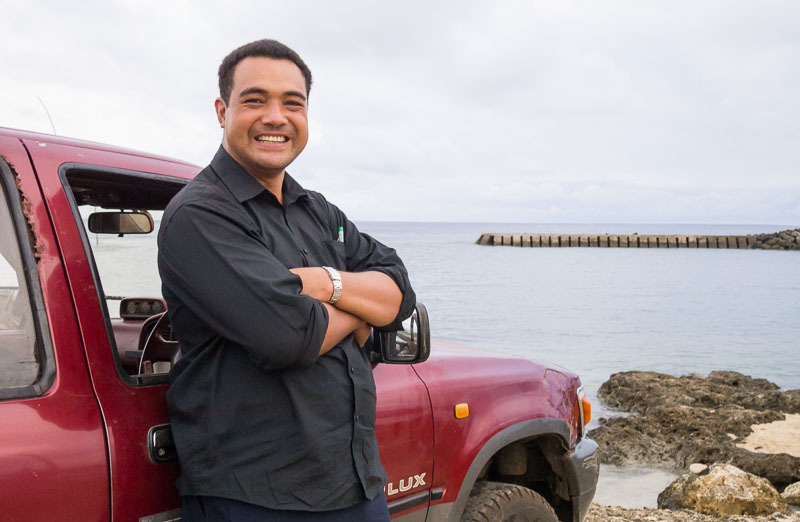 I was also able to spend some time interviewing Maxy about his passion for Bible translation, his faith and his work with the new Bible Translation Organisation (BTO) of Tonga. That story soon. That afternoon I was travelling in this small plane on what is believed to be the shortest commercial flight in the world. Eight minutes later we landed on the island of ‘Eua, and you’ll never guess who collected me from the airport this time! I’m walking across the tarmac and I see the only other white person behind the fence waving in my direction. I didn’t recognise her, and looked behind me to see who else she could be waving to. I was expecting a Tongan to collect me! As I got closer, my brain recognised the familiar face in this unfamiliar setting as Margaret Love, a friend who had recruited me to Wycliffe and went through the initiation paperwork with Brad and I. How astonishing! Then my brain caught up, she must be here running the Bible storytelling workshop that I was visiting. I greeted her with an astonished hug and she confirmed my theory. What joy! I was frightened about no-one receiving me at the airport and it turned out to be a good friend from Australia! Margaret and her husband Robert (aren’t they cute in their matching outfits!) were on the last leg of a 6-week long tour through Fiji and Tonga facilitating Bible storytelling workshops and training this lovely Tongan girl below – Suliana. I was glad that I had blindly travelled to ‘Eua to visit the Bible storytelling workshop just to spend some time with this girl. Suliana is a vivacious 20 year old Tongan with a passion for telling God’s stories. She led the workshop in Tongan with help from two more beautiful Tongan girls, Mele and Lupe, and referred to Robert and Margaret in English when necessary. Suliana was just completing her training to spearhead a Bible storytelling program for the Bible Translation Organisation of Tonga. She has a powerful testimony and a vision to work in oral storytelling in Kenya. I’ll tell her story soon too. But most importantly, the man I had really come to meet was Tevita and he started telling me his story while relaxing at the seaside that afternoon. My ‘gut’ was right. I finally pinned him down for an interview back in the capital city the night before I left. I discovered that it was his desire to serve as a Bible translator that started this whole movement in Tonga. Well, God had been preparing Luseane, Maxy, Suliana and others as well. But Tevita’s passion brought them all together. Through Tevita and his wife Luseane, God is creating a wave of Tongan Bible translation workers to minister throughout the Pacific. Just like Tongan missionaries set out on ocean canoes hundreds of years ago to take the Gospel to the other inhabited islands of the Pacific, history is repeating itself in the best possible way. 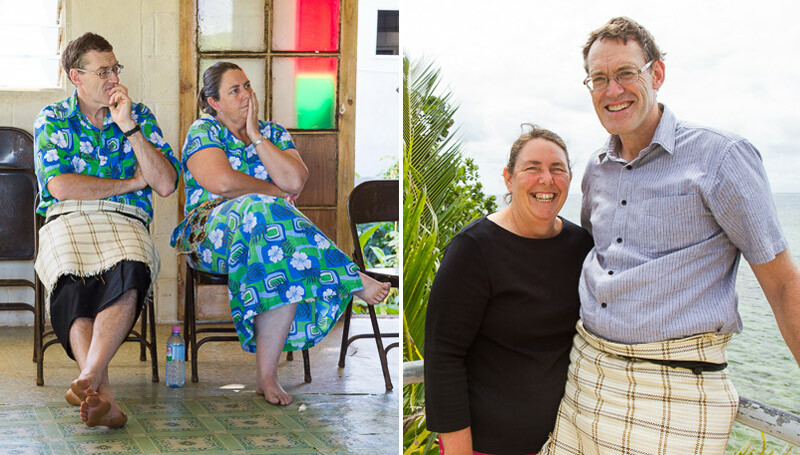 I spent four days on the island of ‘Eua (two more than expected) interviewing the participants of the Bible storytelling workshop, taking photos of Tevita, getting to know Suliana and catching up with Robert and Margaret. I could only interview the workshop participants during breaks so I kept busy! On my second night on ‘Eua we all went to a nearby village for a big celebration where a young pastor was giving his first sermon. The feast that followed the long church service included every type of food available. There was lobster, fish, corned beef (of course), noodles, root vegetables, Chinese food (many Chinese people operate stores in the islands), rice and the most special dish – a small piglet spit roasted whole and laid like a prize on the table. The man sitting next to me cut off a big tasty piece for me with lots of fat under its crackly skin. I love to try new food, but I loved it even more when he happily ate it all for me. Sadly, baby pig fat didn’t make it onto the list of weird foods that I’ve eaten. In Tonga it is customary for people to share their thoughts, issues or stories with those gathered during a meal. In Australia we usually have any important announcements or speeches to those gathered before a meal, or before dessert. But in the Kingdom of Tonga people take turns to make their speech while everyone is eating. I think this is a great system! You don’t have to wait for your food and you can just listen while you are eating, or turn and watch the person if you want. It also tends to save you from any awkward mouth-half-full conversation with the person sitting across from you. In this photo Mele is telling a Bible story that she has crafted, the story of Lazarus being raised from the dead. She is crying as she tells the story and also shares of the recent death of her mother. Mele usually lives in New Zealand, but this is her home village, and she remembers her mother during this visit. The next day the workshop participants broke up into small groups and headed out into the town to find people to share their completed Bible stories with. A rare shot of me during this excursion – I think this is the only shot of me in Tonga! (I need a new hat). One family invited us for sweet balls and milo in their house. Sweet balls, as I call them, are deep fried dense balls of sweet bread and surely the most tasty of all Tongan food. They made them fresh and hot just for us and I’m sure that one of them would be the average person’s necessary energy intake for a day, but I had… four, five, six?… I can’t remember. Way too many. That afternoon the workshop wrapped up and the participants left enthusiastic about sharing their Bible stories, teaching other people how to tell stories and also about meeting together outside of the denominational divides which is rare in Tonga. Even though all of the feedback and discussions were in Tongan, Mele translated much of it for me. It is incredible to see how deeply this short workshop impacted those who attended. The Bible can do that, when you really dig into it. 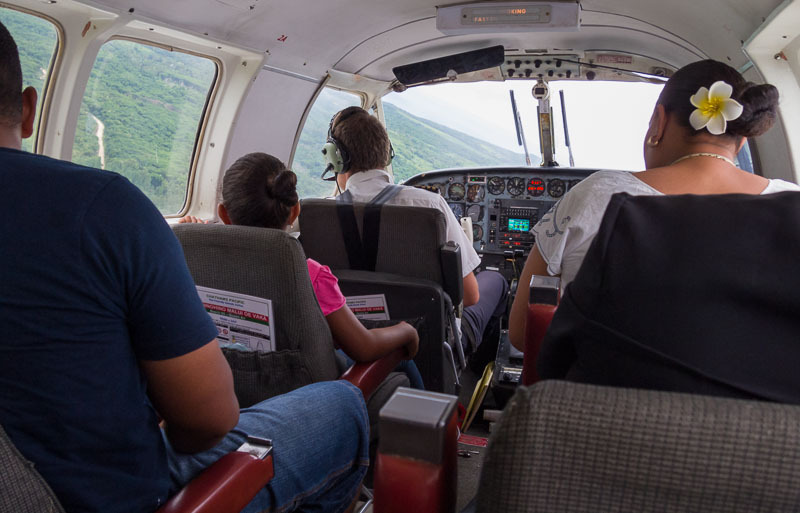 I was supposed to fly back to the capital, Nuku’alofa, that morning but I transferred my flight to Tevita so he could get back for the meetings with the BTO Tonga board and the Wycliffe Global Alliance consultants. The regular boat that had brought out the Bible storytelling team from Nuku’alofa earlier that week had been deemed unseaworthy soon after. So the usual boat schedule had stopped, the one flight a day was booked, and Tevita had no other way to get back for the meetings he had organised. We didn’t know when or if another boat would come to ‘Eua, but I resigned myself to stay on a few more days, it was more important for Tevita to get to the meetings. That afternoon a few of us went for a swim in the ocean and I was feeling cold so I walked home by myself. I had a nice long chat with Suliana that turned into a fascinating interview. That night, despite the 30C-ish heat and extreme humidity I was feeling very very cold and excused myself from (yet another) church service to put on all my clothes and shiver under the blankets. Suliana brought me some fresh bottled water and I quickly fell asleep in the pastor’s office that was my bedroom while the others sang worship songs. In the morning I woke up and rushed to the toilet in Robert and Margaret’s small concrete house. There was no door on the bathroom and they quickly evacuated. Apologising profusely, it became apparent to them that I certainly wasn’t faking an illness to skip church and after a few dry breakfast crackers and some lemon leaf tea I went back to sleep until after lunch. Well, I slept in between a few concerned people checking on me every few hours. We’d heard that a ship was coming to the island that afternoon so at about 2pm we packed our bags and headed down to the wharf. I started to feel a bit better as we sat on the concrete tables, and even did some interviews with Mele and Robert as we were waiting for the ship to come in. We waited quite a while, but after a couple hours we finally saw it in the distance, making its way to us. The ship was too big to come into the small harbour so they sent a smaller boat to first unload the passengers along with several containers of supplies for the island shop. This took hours. It was dark by the time we boarded, and yet we waited a few more hours on the ship which was bouncing about on the waves. I’d been fighting off nausea for many hours by the time the insides of my stomach finally met the cool dark ocean. After that I somehow fell asleep on the cold, hard and very windy front deck of the ship. We were on the ship for about 7 hours and it was 2am by the time we arrived in Nuku’alofa, 12 hours since we left our accommodation at the church. Did I mention that the flight took 8 minutes?! Travelling is full of ups and downs and on assignment with Wycliffe is no exception. I’ve had some of the best experiences of my life while travelling, so I can live with a few bad ones. These 12 hours are definitely on my list of ‘Top 5 Worst Travelling Experiences’. If I wasn’t sick, very very sick, then it would have been just another long but forgettable journey from one Pacific island to another. But I will certainly not forget this boat trip. Despite the short night I was up early to the enchanting sounds of a Tongan choir practising down the hall from my room in Nuku’alofa. I found my colleagues at breakfast and we set off to celebrate the 1st Birthday of the Bible Translation Organisation of Tonga. I met and interviewed the Board members that were present at the meeting and enjoyed collecting some background information on BTO Tonga. I decided to fast out my stomach bug by not eating for 24 hours so the only thing I ate all day were a few purple potatoes for dinner. If you haven’t been to church in Tonga, then you haven’t been to Tonga. This is the King’s church in Nuku’alofa and needless to say is at the top of the Tongan church’s hierarchical structure. Visiting this church is probably my favourite experience of my visit to Tonga. We arrived early since you have to get there before the King. Everyone inside is wearing black to mourn the recent death of the (former) King, yet the front third of the pews are taken up by young boarding school girls wearing white dresses and matching pigtail braids. They sing like angels and the sound echoes around the high ceilings of the building. I walked in with my mouth wide open in amazement before scrambling for my audio recorder. A handful of tourists sat awkwardly in the back rows wearing skimpy tank tops and sun dresses. If you visit this church – cover up, and to be safe, – wear black. A few girls from the several-hundred-strong school girls choir enjoyed having their picture taken after the service before they were all marched away in neat lines. I didn’t take a lot of scenic shots during my time in Tonga, but I was finally well and able to get around a bit on my last day. Like many nations, in Tonga there is a noticeable contrast in the type of housing available. These houses were on the same street. On Sunday morning after church Tevita took us visitors on a tour before stopping at his parent’s house for a fabulous lunch. This beautiful coastline, known as the Mapu’a ‘a Vaea Blowholes, is a little drive out of the capital on the island of Tongatapu. When the waves crash into the coast they explode out of holes in the rocks with great force and spectacle. It’s incredible to watch. You see the bright blue wave arrive and explode like synchronised fireworks, one at a time as it meets the rocks, then the whitewash waterfalls back into the ocean before it explodes again. And it is happening as far as you can see down the coast. After this trip I was home for three days (just long enough to get a prescription for antibiotics) and then off to Thailand for a big conference, but that’s another story. If you are a part of the Wycliffe Global Alliance all these photos and a hundred more from Tonga are available for download on the web photo gallery – Skip. What fabulous pictures of a lovely people. Sorry you had to suffer to get the stories but from my point of view, it was worth it! Hi Elyse, Really enjoyed reading about your visit to Tonga — and seeing some familiar and some new faces. It will be wonderful to have Tongans join us in the work of Bible translation! Thank you for sharing your trip to my home island, Tonga. Fabulous pictures & stories! May I ask what camera you used? Hope you enjoyed your stay over there.